Popular culture and media show us that people of all ages benefit from pets. Seniors especially benefit from this type of relationship. 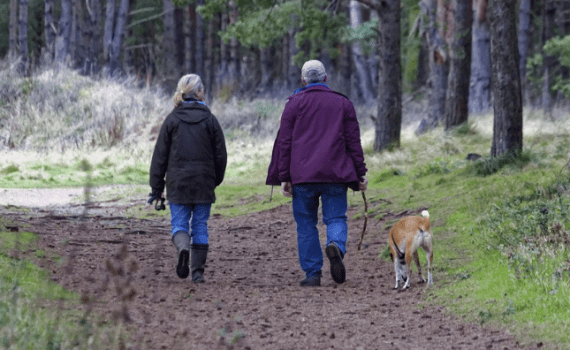 Pets not only enhance seniors’ lives but also improve their health. There are many amazing benefits that pets can bring into an elderly person’s life. Pets provide a comfort system and help to increase the production of the feel-good hormone, serotonin. They have also been shown to reduce blood pressure and stress levels in humans and can help lower cholesterol, fight depression, and help protect against heart conditions. All great reasons for seniors to have a pet! Recent studies have proven that pets can cheer up lonely seniors and enhance their quality of life. One of the most challenging aspects of aging is isolation and loss of social interaction. Many senior citizens may begin to feel cut off from the outside world and struggle with depression. Those feelings of loneliness can lead to stress, anxiety, and medical complications. If you know an elderly person living alone and struggling to find the motivation to get out, ask them to pet-sit for you. See if they’d be interested in fostering a homeless pet. Or offer to come to visit them with your four-legged companion, especially those with no family near-by. Many senior living communities do have Pet Coordinators to help care for the animals to assure they are getting proper activity, food, medication, and love. 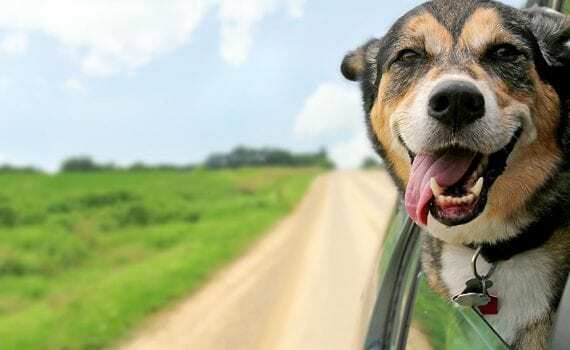 These pet-friendly communities are thriving as pets have become community mascots and give residents reasons for social calls; all great for seniors’ stimulation. It’s important to do your research when choosing a pet friendly community as some communities offer dog grooming and dog walking services for many sizes and breeds, while others only allow small pets with a weight restriction (usually under 20 pounds) — limiting the pets to small birds, cats, dogs, fish or rabbits. Some communities only allow pets on a case-by-case basis. So, make sure to contact your communities of choice and ask about their pet policy. Caring for an animal stimulates physical activity and gives many people a feeling of purpose. This is very important for seniors to incorporate into their everyday lives. Pets need exercise too! This companionship often promotes the purpose and healthy living, the relationship is not one-sided; the benefits are reciprocal to both parties. Many times, the best prescription for healthier living comes with four legs and fur. If laughter is the best medicine, then pets must be the best cure! How Much Activity Does My Dog Need? This is a complicated question. The amount of daily activity for dogs will differ depending on the breed, age, and health of your dog. In this post, we’ll dive into some recommendations. Ultimately, this is a great topic to discuss with your veterinarian, since you both have an understanding of your pet’s total well-being. Dogs need two different types of activity: exercise and mental stimulation. When dogs lack either of these, they tend to get into trouble, acting out behaviorally and destroying items they shouldn’t. Proper nutrition, exercise and mental stimulation can be achieved in a variety of different ways and can be great fun for both you and your dog. Pet health experts recommend that depending on the size of the breed, the age of the dog, and the dog’s overall health, anywhere from 30 minutes to two hours of activity is recommended per day. The smaller the breed the less exercise will be required and the exercise should be appropriate for the build of the breed. This means we wouldn’t take a French bulldog for a three-mile trail run. Chasing a toy, indoors or outdoors, or frolicking around the yard, can achieve the 30 minutes of healthy activity in a smaller breed needs. More than this may cause respiratory problems or other injuries. Be sure to consult with an expert about your specific breed and dog. These breeds are built to work and will require more exercise and mental stimulation than their smaller, more delicate cousins. Terriers were bred to hunt or chase down a certain type of prey, from foxes to rats, and as such have more energy and durability. This results in the need for a higher amount of exercise and stimulation to keep them healthy and out of trouble. Depending on your breed you could be looking at closer to an hour or two of activity per day. These are dogs that mature to weigh between 45 and 99 pounds. Like Terriers, Labradors, Retrievers, Huskies, Shepherds and Poodles were bred to work as well as to be companion animals. These dogs are smart and have a high level of energy, requiring between 60 to 90 minutes (sometimes more) of exercise per day. As these dogs start to age, their level of physical activity will diminish and pet owners should watch for signs of hip injuries or conditions like dysplasia. Talk to your vet about your specific breed and which types of exercise and stimulation are best for your dog. Extra large dogs are breeds that weigh in excess of 100 pounds at maturity. These dogs will typically require between 30 to 60 minutes of exercise per day depending on their age, weight and health. Your Mastiffs, Great Danes and other large breed dogs will have a lower energy level than their large dog breed cousins. You should talk to your vet regarding your specific breed and dog to avoid injury and ensure the best quality of life for your XL fur baby. From fetch, to tug, and wrestling to playing with other dogs, there are a number of different ways to exercise your dog. If you live by a local dog park, off-leash play provides both exercise and socialization (which is a form of mental stimulation that we’ll talk about later). While your Fido might love to chase a good stick, there are a few dangers when using objects that can break. We prefer to a good ball, rubber disk, stick alternative, or even a partially deflated soccer ball. Get outside and enjoy some quality time with your pet by walking or hiking. Take in the views while your pup takes in the scents, and raise your heart rate together. Depending on the area and ownership of the land, you may be required to keep your dog on a leash or lead. When both you and your dog can use a bit of exercise, running is a great option. Running can also help keep your pets nails trimmed, but be sure to keep an eye on the pads and nails to avoid injury. Pavement can heat up in the sun causing burns in the summer, and salt from winter road maintenance can burn as well. When jogging or running with your pet, we recommend a comfortable and snug fitting harness, with a non-extendable, durable leash. Whether it’s in your backyard, at daycare or the local dog park, romping and wrestling with other dogs is a total body workout for your fur baby. Dogs jump, run, and get a myriad of exercise when playing with other dogs. And, you get to stand by and enjoy their happy antics! Remember it’s a good idea to engage with other dog owners before allowing your dog to play, and staying engaged to make sure play doesn’t get too rough. Dogs are intelligent and sentient creatures, and just like humans, they can get bored. 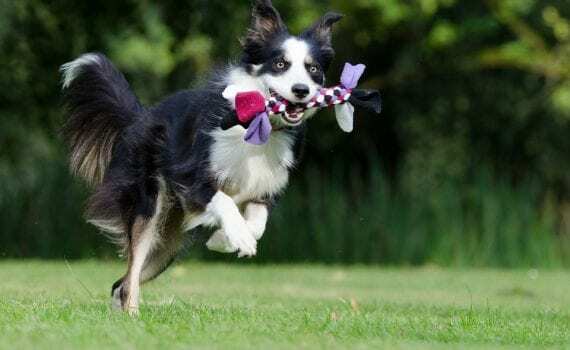 As they look for means to entertain themselves, it is helpful to have a variety of toys on hand so that your dog opts for something of their own rather than your shoe. Terriers and hunting dogs have an inherent prey drive. They were bred to hunt. Now that many of us don’t hunt they need another way to occupy their time. Toys, especially ones that make noise are a great option. You can find an array of different priced options in various sizes. A number of different retailers now offer puzzles for your pet. You load them with treats and give to your pet for mental stimulation. The puzzles make the dog work to find the treats, providing an entertaining and rewarding challenge. There are also some great ways to make your own dog puzzles on sites like Pinterest. Not all stimulation requires you to shell out cash. Some dogs can learn and love to play hide and go seek. The downside is that you are the one that always ends up hiding. This provides a bit of exercise as well, as they run around trying to find their favorite human who has magically disappeared. Check in your area for canine classes – The sport of dogs has grown in the last few years. Along with Obedience classes, there are Nose work classes, Fit paws – Fun and Fitness Classes for your K-9 friend, Agility, Rally, Trick Dog, and Canine Good Citizen. All of these will stimulate your pet and you to be active, spend time together, and grow. Thinking about taking a camping trip with your dog? Worried that it might be a bit stressful? With a little bit of preparation, you can bring your canine companion along on your next camping trip for a relaxing getaway. We’ve pulled together some helpful tips and tricks to help you get started. There’s no air conditioning in nature, so staying hydrated is important. A collapsible bowl is a lightweight and portable tool that helps you make sure your dog is getting enough water. Allow these bowls to dry before collapsing them to help keep them free from anything unsanitary. Northwest Naturals Freeze Dried Diets makes feeding your pets while hiking and camping with your pets easy. Lightweight and convenient to feed, the NWN Recipes are complete and balanced for your canine companion. Just pour in a bowl and add water. The Freeze-dried nuggets can be fed during the day to keep the energy level and nutritional requirements stable while hiking. For weekend camping trips, you can pack your raw frozen diets that have been frozen into convenient portions. Smaller portions stay fresh longer and can be frozen to maintain freshness (and act as ice packs). Packing an easy to transport treat option like freeze dried treats makes rewarding, and spoiling your pet safer, healthier, and easier. Freeze dried treats won’t spoil and don’t need to be refrigerated. They’re wholesome and healthy options for which your pets will go bananas. While bandages and wraps might work on both pets and humans alike, when it comes to scrapes and sores, pet first aid is very different. Pain pills and anti-inflammatory drugs that are made for us can be poisonous to them. It’s also a good idea to have a salve or poultice that will stop a scrape from bleeding if you are going to be hiking any rugged terrain. Often overlooked, a small light that can clip to your pets collar or harness is a great way to keep them safe at night. Keep an eye on your pet as it gets dark, while you sit around the campfire and after the lights go out, make nighttime potty breaks a breeze. Preparation is the key to a great outdoor experience with your dog. Now it’s time to hit the trail and enjoy some fresh air and nature!